Evan Lindquist heard stories about his Aunt Emma all his life. 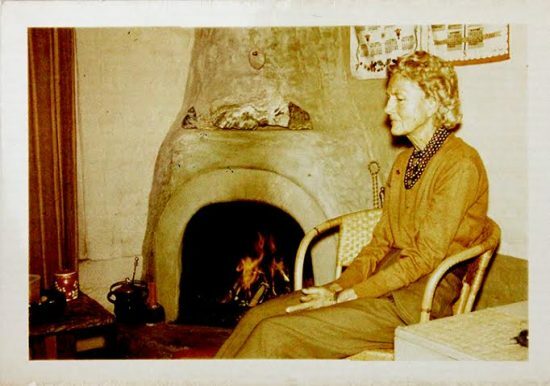 She was a beautiful blonde artist–a friend to Greta Garbo and D.H. Lawrence–and she ruled over an artists’ colony called Sven-Ska somewhere out in the California desert. To a boy growing up in small town Kansas, Sven-Ska seemed as exotic as Atlantis. This legendary aunt had inspired Lindquist to become an artist himself, yet he’d never met her. Finally, in 1959, he and his wife, Sharon, were driving from Yuma to Palm Springs. They came around a curve and there was a sign on the highway that said Sven-Ska. Christina Lillian at Sven-Ska. Photos courtesy of Evan and Sharon Lindquist. Sven-Ska sign to left. 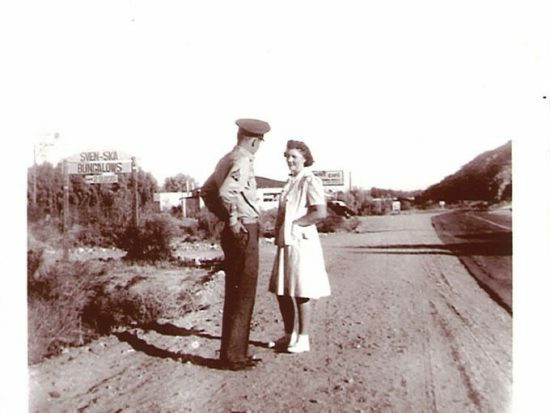 Main Street, Cathedral City, 1942. Courtesy of Cathedral City Historical Society. Lindquist had stumbled on the Valhalla of early Cathedral City artists, Sven-Ska. The route was winding and obscured for him, as it has been for many of us who have wanted to know more about Aunt Emma–known during her desert days as Christina Lillian. Christina was our California desert equivalent of Taos’ Mabel Dodge Luhan: a charismatic figure who used her glamour and wealth to support artists. While Mabel Dodge and her circle are celebrated in books, plays and art retrospectives, Christina Lillian and the artists (most were women) of the Cathedral City Cove are today obscure. I first heard the name Christina Lillian mentioned as the owner of a midget rock house in the Araby Cove, where artist Burt Procter lived. 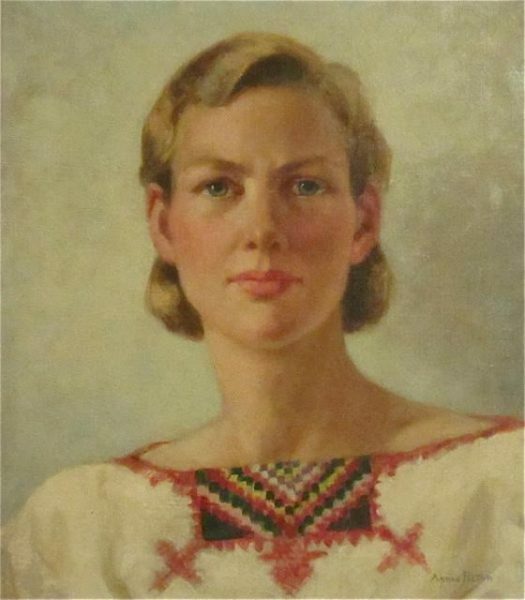 Then her name came up again on the back of a 1949 painting (an image of Sven-Ska itself) by Sam Hyde Harris. 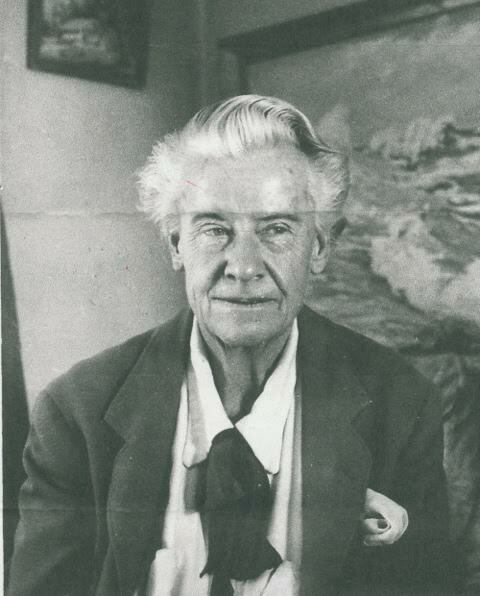 And in a letter written in Cathedral City in 1936, Agnes Pelton mentioned her wealthy neighbor, Christina–a dress designer who was able to retire at age 35. Lindquist himself is a celebrated artist and printmaker. A master of the burin (an ancient engraving tool), he earned recognition as the first Artist Laureate for the State of Arkansas. His engravings are included in 71 permanent collections worldwide, including the Metropolitan Museum of Art and the Whitney Museum of American Art. By the time Lindquist was 5 or 6 he was sure he was destined to be an artist, a conviction inspired largely by the aunt he’d never met. “My mother and father talked about Aunt Emma. My grandmother talked about Aunt Emma. My uncles and aunts talked about Aunt Emma.” Aunt Emma persuaded him “that an artist can do anything,” he says. Evan and Sharon Lindquist were able to fill in some of the mystery of Christina (aka Aunt Emma). Born in 1888, she grew up in the plain little towns of Salina and Lindsborg, Kansas, which may be why she was later drawn to the plain little town of Cathedral City: It felt familiar. The future costume designer kept busy making clothes for her six siblings–dresses for her sisters, shirts for her brothers. 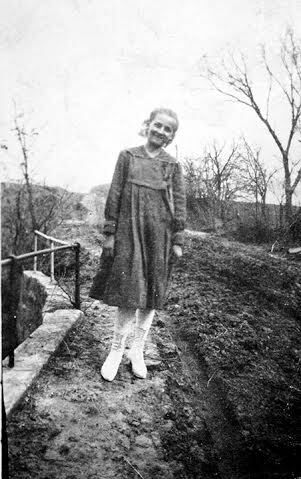 Saving up money from a receptionist job, Christina left Kansas after her father’s death in 1915. She paid her own way to Hollywood, where–as promised–she became a successful gown designer, making costumes for Greta Garbo films, among others. As part of her Western metamorphosis she dropped Emma and became Christina. 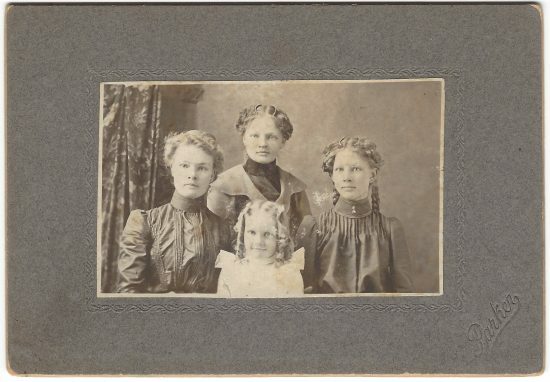 Christina, right, and her sisters Anna Matilda, Marie and Edith. Like Mabel Dodge in Santa Fe, Christina was seeking “a new world plan”. The ingredients included communal living, immersion in nature, study of metaphysics and spiritual pursuits. A cornerstone of this new world was art. 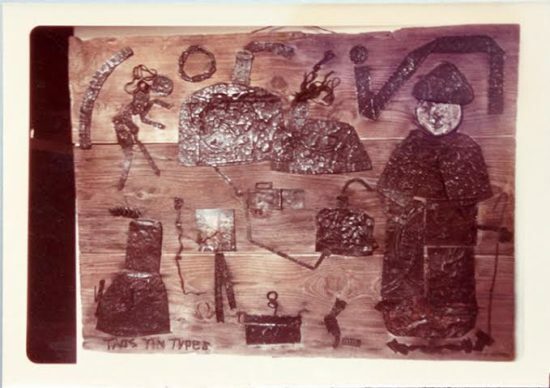 While Christina was an artist herself (she made constructions from cast-off tin and called them Taos Tintypes), she poured most of her energy into encouraging and housing her fellow artists. The Swedish rebel from Kansas puttered around the Arizona outback, offering rides to Indians. She found one man who had been out hunting and was trudging along with a stag across his shoulders. When the man declined her offer of a ride, Christina followed him until he finally gave in to fatigue and laid the carcass across the fender. Christina even married briefly (breaking her own vow) during this sojourn–a man named Isadore Burnsides, according to Cathedral City historian Denise Cross. The marriage looked like a replication of Mabel Dodge’s recipe for an avant garde life–head for the Southwest and marry an Indian. Moving to the Coachella Valley, Christina first owned a small stone house in Palm Springs, reminiscent of the stone house her parents lived in on the Kansas frontier. The Araby cottage–still standing–was designed by a little-known architect R. Lee Miller, the imaginative force behind some of Palm Springs’ earthiest structures. Christina put up artists in Araby, then moved further down Highway 111 to Cathedral City. Christina Lillian, right. Artist Burt Procter holds his daughter, Ginny Bohannan. No one knows exactly who or what brought her and her friends to this village, the poor relation of posh Palm Springs. In the days before development, Cathedral City had the most expansive views–all the way to San Gorgonio and the little San Bernardinos. Rents were cheaper here, too. Cheap digs and big vistas may have played a part in the appeal. Matille (“Billie”) Prigge Seaman, courtesy Cathedral City Historical Society. There has long been buzz in the art world that Agnes Pelton was gay, but this is not confirmed. Christina wore pants and swore her intention to never marry. Harriet Day had a child, who died of TB, but for the most part the circle consisted of unmarried women with no children. This was also an era, however, when a subset of women rebelled against Victorian norms and fled to the Southwest, wore pants and thumbed noses at convention. Their experimental lifestyle did not necessarily mean they were lesbians. In any case, Cathedral City can claim its very own women’s art colony–a rare thing in American art history. Christina’s new neighborhood had a lot of visitors from Santa Fe. The link was the Transcendental Painting Group, founded in New Mexico in 1939, with Emil Bisttram as founder. Pelton was a member of this group; Dane Rudhyar and others visited both her and Christina in Cathedral City. The Mabel Dodge circle was being replicated in miniature in Cathedral City, with some differences. Taos was exotic in location and culture, abounding with Indian pueblos, clairvoyants and communes. Cathedral City was a prosaic blue collar town replete with brothels and bars. If there was going to be anything exotic in Cathedral City, the artists had to provide it themselves. 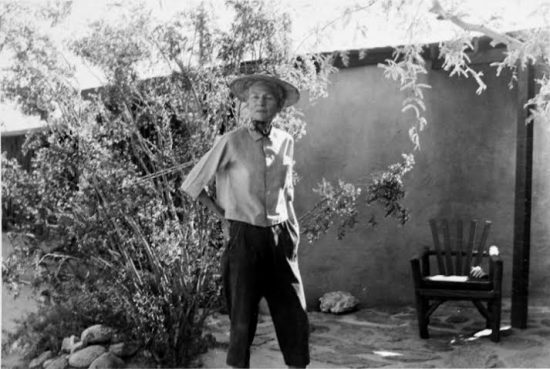 By the 1940s, Christina and friends were involved with the founding of the Palm Springs Art Museum (then the Palm Springs Desert Museum). Members of her circle helped create the Desert Art Center; and they staged exhibits at the home of Pelton, Cathedral City’s first art exhibit space. 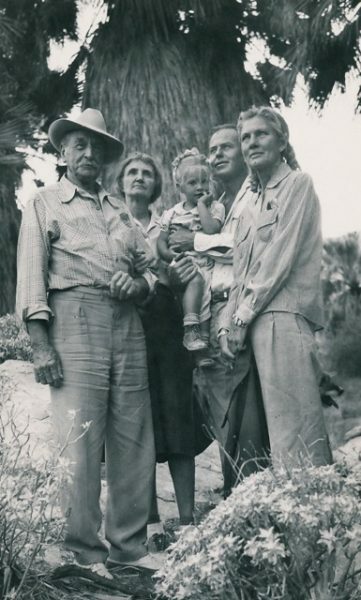 Along with hosting Santa Fe artists, they entertained Cabot Yerxa, builder of Cabot’s Pueblo; Harry Oliver, creator of the Desert Rat Scrapbook; California Impressionist painter Sam Hyde Harris; Marie Kopp, director of the Desert Magazine art gallery; and Betty Cree, a Palm Springs pioneer and founder of the Desert Inn art gallery. 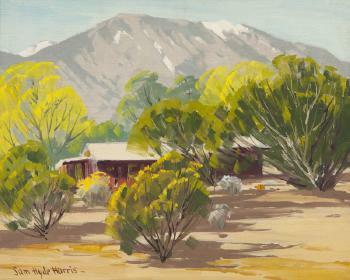 Phil Dike, one of California’s best-known watercolor painters, stayed at Sven-Ska regularly. The Sven-Ska women were fully immersed in small town life–decorating tables for Women’s Club luncheons, giving neighbors rides to the market–at the same time they were quietly probing philosophy, the occult, mysticism, Theosophy and how it all related to art. In the last decade of her life Christina Lillian moved to Claremont, California, to be near a relative. She died there in 1976. The little colony in Cathedral City Cove was entirely forgotten until recently, as art collectors and scholars have rediscovered Agnes Pelton. With the interest in Pelton, her free-spirited neighbors are beginning to peek from the shadows. Still, the daily lives of the Cove artists remain shrouded in mystery. We await the discovery of a journal, letters or–better–a living witness to tell us the bigger story of Christina Lillian’s New World Order. Great article Ann. Also Christina was president of the Womans Painters and Sculptures of San Francisco in 1925. I have documentation . Also Billie Agnes and Christina all came here from Pasadena . Agnes and Christine the same time. That’s not to say Christine didn’t have contacts or a home in Cathedral City same time Billie did. That I don’t know. But through Proffesor Shelley’s dissertation and photos Agnes saved It has been made clear They came here together. We will have Christina’s plaque completed this month and will go besides Bettye Kirkpatrick Cree’s next to the 40 ft public mural of the CC Artist Colony. Fifteen artists. Their story is in my upcoming book Desert Art Centrer Inc. of Coachella Valley Cathedral California. I have been giving this new information freely and have been trying to tell you for a while. I am in the process of sending Christina’s family a hard copy of all I have found on her. thank you dear ann, a most wonderful display of an inspiring woman’s life, very well lived! Another wonderful story Ann, thank you for bringing this time into focus it is so interesting. Thank you for this fascinating look into some lesser known desert art history. Thank you Ann for this wonderful article. I am also a great-niece of Aunt Emma. Her sister, Anna Mathilda, was my grandmother. I had the pleasure of meeting her as a child and her presence left a great impression on me. Such a sweet and caring person. It is such fun to hear these stories. My first cousin, Evan Lindquist has shared many tales with me, but it is easier for me to remember in a form such as your article. I love the inclusion of a bit of Evan’s work, as he is such an amazing artist – definitely acquired the “art” gene in our family. Peter, thank you for your time and passion invested in the lives and works of these great artists. I look forward to your book, and the finished mural. Very exciting! I really enjoyed reading this. It was fascinating, colorful and an enchanting peek into an artist’s life. Thank you for your continuing articles about artists in the desert. This is a great article! Christina was my great-great aunt, and I learned a lot about her by reading this. I’ve long felt that her life could be a basis for a film–at least, if more gaps could be filled in. As an art historian and a heritage studies educator, I keep her in mind for future research projects. 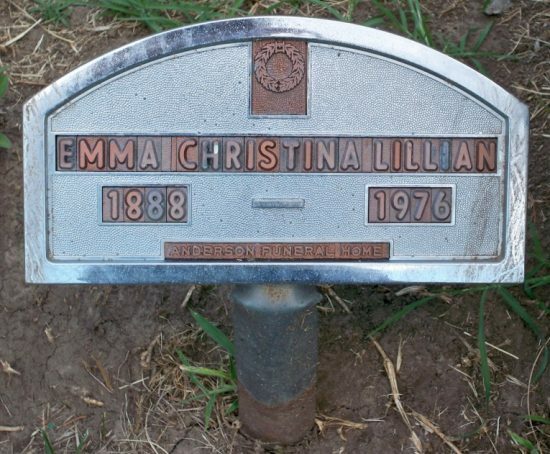 Incidentally, I notice that her headstone has the first and last ‘8’ in 1888 placed upside down. I don’t know whom to contact about this, or even if they would be responsive. Perhaps one day the family can arrange for a more befitting memorial. Thanks Ann! It’s a splendid article and fascinating in many ways. Thank you, and your colleagues, for putting together this uplifting story and important piece of history. Greatly enjoyed this article and the pictures of Grand-Aunt Christina, sister of my grandmother Marie Ethel Lillian Francis. I did not meet Christina until 1967 when she visited in Pueblo, Colorado, but she was always a legend in the family because of her non-conformist views. She always kept in touch with my mother Lillian and my aunt Maryellen. The details in the article about her bohemian lifestyle, contemporaries, and artistic bent are of particular interest, and I shall share it with my daughter. Well done! Christina Lillian was a trustee for the Palm Springs Desert Museum (now Palm Springs Art Museum) from 1940 to 1957. I loved reading this article! I live in Desert Hot Springs and am a member of the Desert Art Center in Palm Springs. I plan to share this with others here. How fun to find this article. Christina Lillian was also my great aunt. Her sister Marie Lillian Francis was my (and Kristine Thorsen’s) grandmother. My Mom Doris Lillian Francis Brownlee was the family genealogist. Aunt Christina was everyone’s favorite great aunt, at least it seemed that way to me. And every single person seemed to be special to her. I can remember letters typed on her uniquely-fonted typewriter arriving, and you knew they were from her! When we were in the San Diego area, when Dad was in the Navy during the Korean war (early 1950s), we went out to the Mohave desert to visit Aunt Christina. Sven-Ska was her motel, in Cathedral City, 6 miles from Palm Springs. My memories are wispy, my twin brother Richard and I were in the first – third grades then. But I remember the desert, joshua trees, some high hills not far away. Christina had a cactus garden. We’d play Cowboy. Christina designed and had made her own water-cooled air conditioning for the motel, what we’d call a swamp cooler today. It was so hot there that she’d always go world-traveling in August. I didn’t know about the artist colony, but did know she knew some famous people. She didn’t brag about it, but every now and then would mention someone within a larger account. I have a portrait of her done by the mentioned Agnes Pelton. I had looked her up on the internet back a ways and hadn’t found any information. I’ll send a photo. 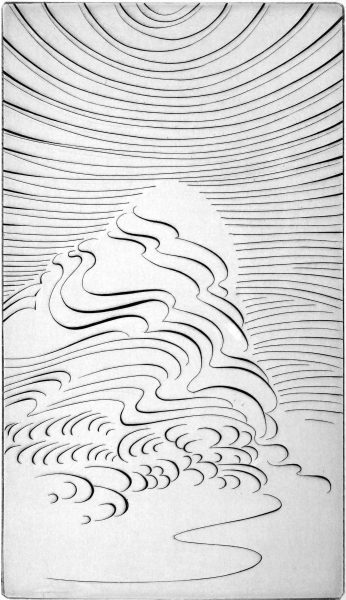 Aunt Christina sent me one of Evan Lindquist’s engravings, “Gravity”, some years ago. I’ve never met him, in fact tried unsuccessfully to find him once. I did meet his mother at one of our family reunions in Lindsborg. Some other cousins, not sure of the lineage, Bunny and Lee (I think it’s Bernice and Leland Johnson from Mom’s address book) in the LA area tried to take care of Aunt Christina in her final years, but she had some odd ideas about health care, high-colonics and the like. I hadn’t seen her grave before. Thanks for sharing this information. Things I’ve never heard before, after all these years! Thanks to Ann Brownlee and all members of Christina’s clan who wrote. Your input is invaluable. The portrait of Christina by Agnes Pelton is a thrilling find, and I’ve added it to the article. Ann B. shared some more rare photos of Sven-Ska, which I’ll be posting soon. Readers may also like to know the Swedish community of Lindsborg, Kansas was the home of internationally famous artist Berger Sandzen. Ann~ Thank you for this expertly researched & keenly revelatory article focusing on a name I have encountered in my own Agnes Pelton sleuthing, but about whom I knew precious little. Fascinating! THIS is absolutely lovely. I’ve known of the painting of Christina by Agnes Pelton for some time. Record of it exists in The Desert Sun newspaper, Cathedral City events, written by Willard Hillary. That painting was first shown to her guests on Christmas Eve 1938, at her home. It is absolutely wonderful that you have shared this with us. Thank you Ann Brownlee, Descendant and the entire Lillian Family. Wonderful work, Ann! This is a great article, but it just means that I want more. My interest is Agnes Pelton and her art, which has led to your information. Phoenix Art Museum has a current exhibition showing Agnes Pelton’s work. Is there anything that can be experienced in Cathedral City now to add more information through a visit? Hi Myrna, I’m glad that the Agnes Pelton exhibit led you to the story about Christina Lillian, and to an interest in Cathedral City. Pelton’s former home in the Cathedral City Cove is occasionally open to the public. There will be more events honoring the early Cathedral City artists as the big Pelton show makes its way to Santa Fe, the Whitney and then the Palm Springs Art Museum. I’ll report more on Pelton-related developments on this website.